Join us Friday, April 19th at 6:30pm for a contemplative Good Friday Service. We will spend time in worship, prayer, and communion, as well as hear a short message from Pastor Josh. Childcare for Nursery age children newborn through Pre-K. 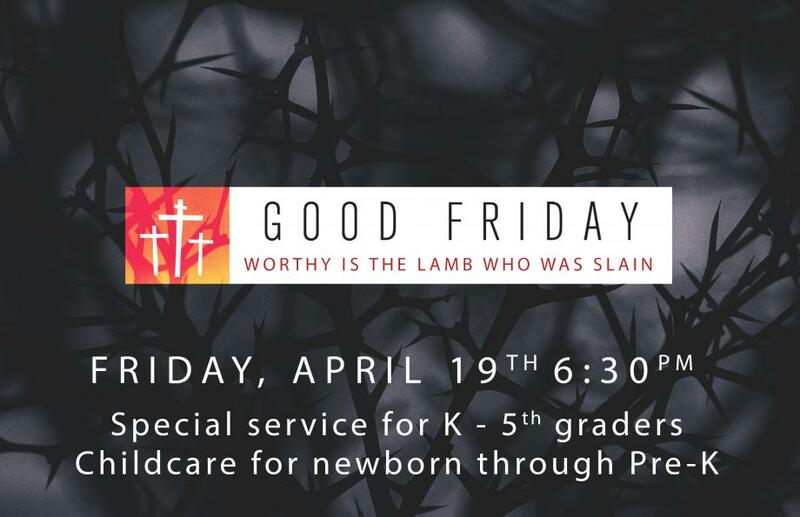 There will also be a separate Good Friday Service geared for your your elementary age children. We would love to have them join us as we spend time focusing on the cross and Jesus' sacrifice. Easter Services are the most attended services of the year, so we need extra hosts & helpers on hand! This is a great chance to use your gifts to welcome & care for others!